The Lakeside Regency Plaza, 1555 Lakeside Drive, is the 15-story condo building next to the Scottish Rite Temple. Built in 1968, it’s definitely of its time yet of enduring taste. 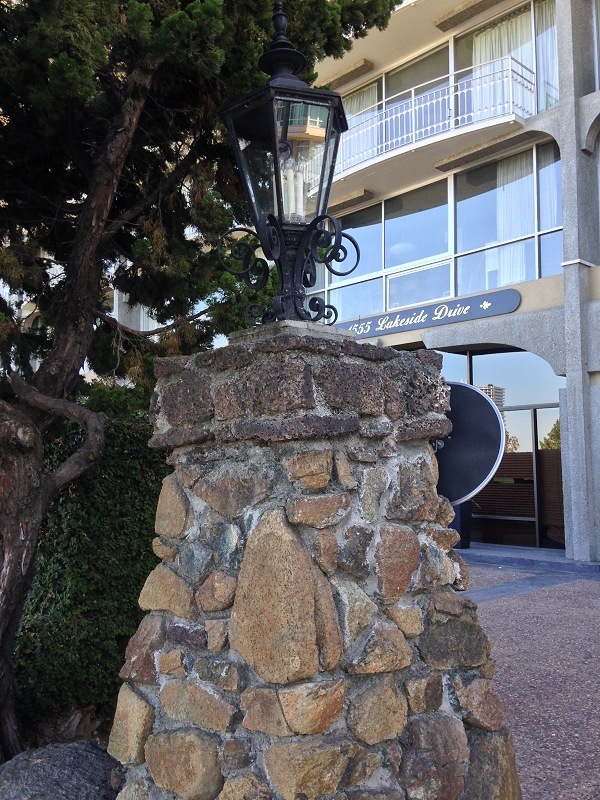 I paid it no mind until a few days ago, when I noticed the four artisanal lampposts that flank its driveway. In their own way, these are even cooler than the serpentinite cladding I wrote about the other week. The large cobbles lining the shaft are peridotite, a stone that’s rare in the first place and not often usable in the second place. Peridotite (accent on the “rid”) is what the Earth’s upper mantle is made of. Because its minerals are more stable at depth than they are on the Earth’s surface, peridotite characteristically acquires an orange weathering rind as the iron content is released from its olivine and pyroxene crystals. It’s usually shot with veins of serpentine, which degrade its strength. These cobbles are field stone, not quarried but gathered from the ground in their natural state. They probably came from a riverbed or talus slope in the Klamath Mountains. The capstones, on the other hand, are lava — specifically, vesiculated (bubbly) basalt like that found in the volcanic Cascade Range. Lava is the opposite of peridotite, to put it briefly, the stuff of the Earth’s crust. These hand-dressed blocks may well have come from northernmost California too, in the vicinity of the Modoc Plateau. Here’s a look at both rock types in closeup. Or, of course, inspect the lampposts yourself next time you’re at the lake. I think of them as examples of deeply understated, perhaps even inadvertent, geologic wit. This entry was posted on 10 July 2017 at 8:03 am and is filed under Oakland stone. You can follow any responses to this entry through the RSS 2.0 feed. You can skip to the end and leave a response. Pinging is currently not allowed. 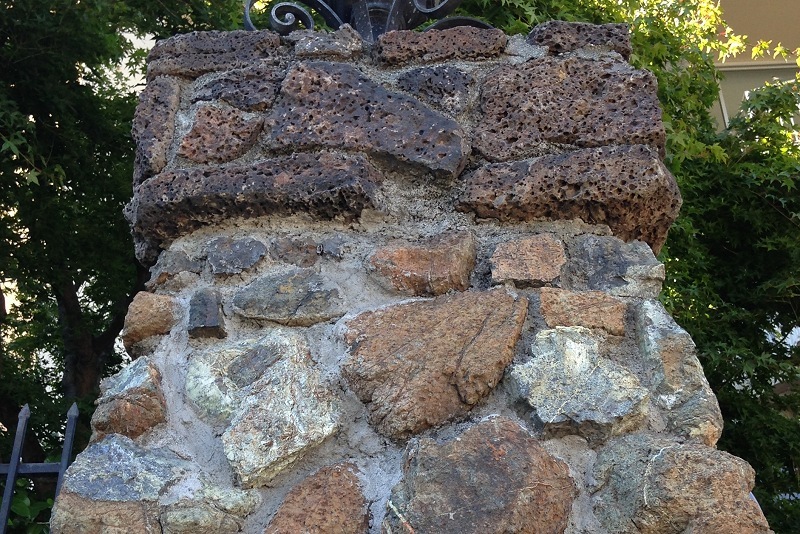 Andrew, referring to the 2nd picture – which of the stones making up the column part are peridotite, all of them? or just some of them? Thanks. I’d love to know how to recognize peridotite in the field. All of them are peridotite, but the lighter-colored ones are partially serpentinized. The best way to recognize this (or any) rock type in the field is to inspect actual examples. I can’t tell you how many times I’ve been by this building yet never noticed the columns. Not that I would have known what they are, but your observations make them most interesting. Since they are not local stones, makes you wonder why the builders chose these and where they got them. Thanks again for another fascinating post.